The attached photo was used to demonstrate a very similar job and pattern of glass finish film that we installed for the US Bureau of Land Management. The offices were located in the Federal building in downtown Salt Lake City. We used a pattern cut out of 3M Dusted Crystal film. In total, we installed 155 windows with this pattern in their offices. 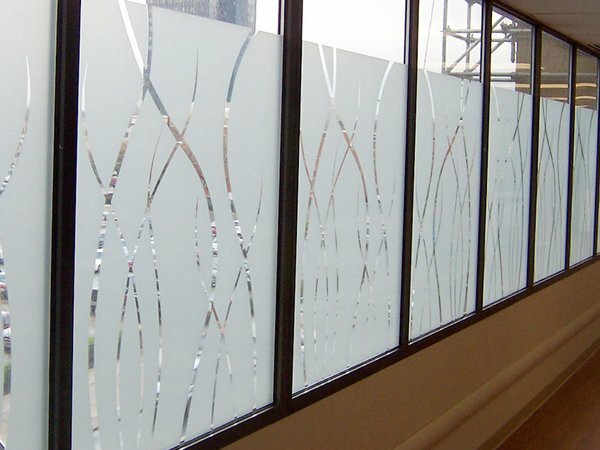 We would be happy to discuss the variety of options available with decorative glass film. Please give us a call at 970-690-8444 or 303-776-1109. You can also email us at ColoradoGlassTinting@gmail.com to receive a free, no obligation assessment of your application.